There are literally millions of articles online about how to get the best price on plane tickets. In fact a recent Google Search showed 7,490,000 entries. Some of these claim that you need to be up at Tuesday at 12:01 am to get the best fare possible, some claim discount travel sites will beat the prices on airlines’ own sites and others have more esoteric schemes such as checking flight prices from countries with lower incomes like Thailand or Panama to arbitrage the price of tickets. There may sometimes be merit to strategies like these, but usually not. There is however one way to ensure that you are getting the best possible price for your airline ticket and that’s to use Google Flights and set alerts for routes and dates. It’s easy, fast and about the only consistently good way to make sure you’re paying as little as possible for flights. First off go to your local Google Flights page. That could be https://www.google.com/flights/, https://www.google.ca/flights/, https://www.google.co.uk/flights/ etc. Then on the top right hand corner sign in. Saving flights to be tracked works in Muti-City mode as well. You need to be logged in if you are going to track flights and get alerts. It’s interesting to note,. the alerts will tell you off a saved search goes up our down. In either case it could let you know in time to save some money. First just to confuse things, Google is switching over to a new interface and since we’d like this article to have legs, we’ll use the new one. But the old classic version will be offered as an option for a good while to come. Right now we prefer the old version but that’s probably just because we are used to it. First off you have to tell it whether you want to search for a Round trip, One Way or Multi-City flight. Let’s start easy and check out a Round Trip itinerary. Next choose the number of Passengers including Adults, Children and Infants in Laps and Infants in Seats. There’s no room for Emotional Support animals (just sayin’). If you say search for two Adults like in our example, the total price you see won’t be per Pax but for the total group. This is a great feature when searching for flights for the whole family. Then it is time to pick the (dreaded) Economy, Premium Economy, Business or (our Fav) First Class seats. You then enter your Departure and Return Dates and your To and From locations. This is where things get really interesting. You don’t have to put in city pairs or airport codes such as JFK to BKK (New York to Bangkok), you can put in your home airport and a much wider search area such as Southeast Asia. 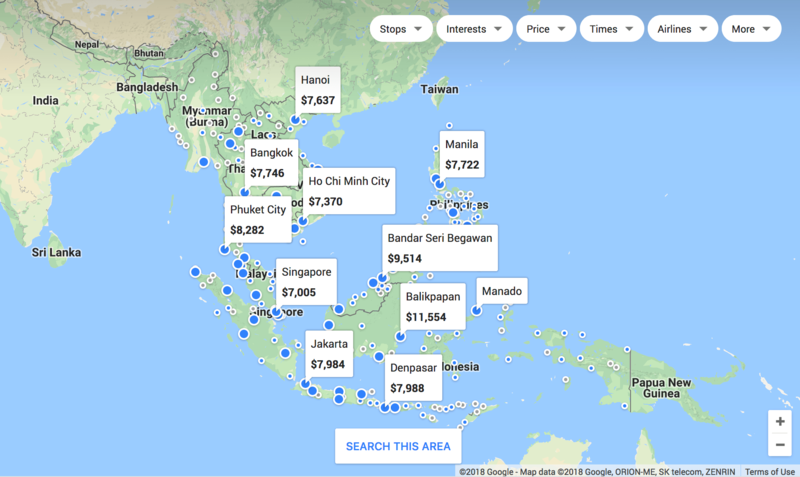 When you do this, a handy map like this pops up showing you various destinations and their price for the search dates. You can further refine your search by Stops, Interests, Price, Times, Airlines (which also allows you to choose the alliances such as SkyTeam, one world and Star Alliance), and More which includes Flight Duration and whether or not you want an option for routings to require separate tickets. You can further refine the search by Language, Country and Currency. As you can see this is very powerful. When you click on a city to view the flights you can further look for options by clicking boxes such as Dates which has a drop down calendar of various prices over a week, a Price Graph, options on alternate Airports and handy Tips which can suggest traveling on alternate days to save money and more. At this point you can choose to Track Flights or click the flights you want and Google will give you options on where to buy the itinerary and the details you’d need if you use a Travel Agent. Don’t laugh some people still do. Those are probably the ones that didn’t know you can’t bring a water bottle through security, but they still exist. Trust us we seem them on every flight. If you choose to track the prices of your saved flights you’ll get an email notification every time the itinerary goes up or down. This is the data you need to know when to book your flights for the best fare possible. Ok that’s about it. 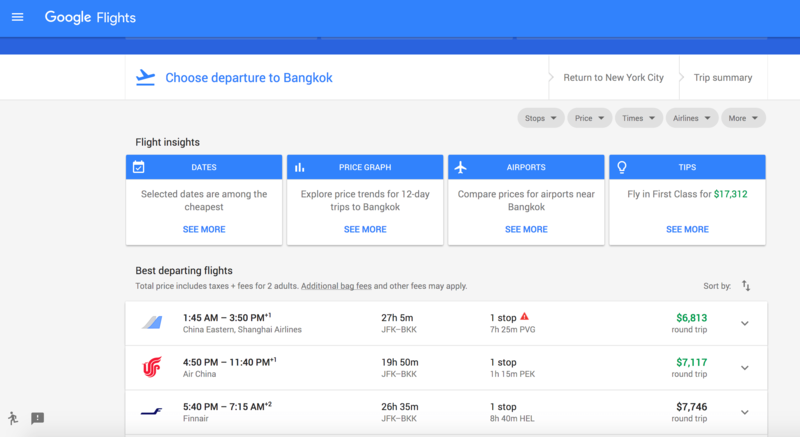 Google Flights is a great way to shop for flight, browse longingly though various dream destinations or to track itineraries and date/airline combos for the best fares possible. Go practice, you’ll love it.